Chris Weisbrod got a scarlet-and-gray greeting from staff. While most of the doctors and nurses donned their scarlet and gray, Dr. Mark Adamczyk made his loyalties to “that state up north” obvious. Then, there’s Chris Weisbrod, interim administrative director of Orthopedics and Plastic & Reconstructive Surgery. Chris is a Buckeye having earned his master’s of business in operational excellence from Ohio State. But he has been critical of what he calls “the university’s football machine,” especially in light of the team’s tattoo scandal and ensuing NCAA violations. 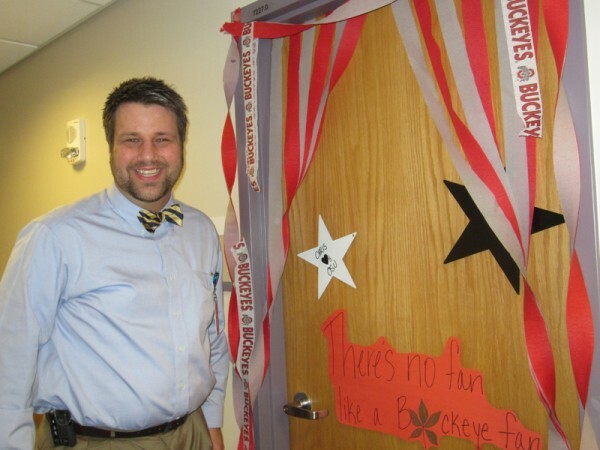 So, on the morning of the tailgate lunch, his staff, as a joke, covertly decorated the entrance to his office with red and gray streamers and OSU cheer signs. Weisbrod took it in stride and even gave a little push back by showing up for work wearing a blue and yellow bow tie. “Hey, I also went to the University of Toledo and blue and yellow are Toledo colors too,” said Weisbrod. Whether you’re a Buckeye or Wolverine or have your football loyalties elsewhere, there’s one thing that we can all agree upon: The OSU/Michigan game is one of the best collegiate football rivalries of all time.